Historians generally credit 1939 as the single greatest single year of American movies. With titles like Dark Victory, Destry Rides Again, Drums Along the Mohawk, Gone With the Wind, Gunga Din, The Hunchback of Notre Dame, Mr. Smith Goes to Washington, Ninochka, Of Mice and Men, The Roaring Twenties, Stagecoach, The Wizard of Oz, Young Mr. Lincoln (any of which would receive my Best Picture vote in another year), 1939 had more box office successes and future Hollywood classics than any year before or since. Fittingly, it ended with one of the greatest rosters of Best Picture nominees in Academy Awards history. The winner was a film that would become the standard by which all American movie epics would be judged, Victor Fleming’s adaptation of Margaret Mitchell’s Gone With the Wind. It would be un-American of me to carp about a film that is such an American institution. I enjoy the sheer scope of the film and the performances are incredible. The landscape of the film is like nothing I’ve seen before or since, providing the Civil War as a fiery backdrop to the struggling romance between stubborn southern belle Katie Scarlett O’Hara (Vivien Leigh) and world-hardened rouge Rhett Butler (Clark Gable), who is determined to win her affections away from that dullard Ashley Wilkes (Leslie Howard). I’ve seen the film many times and I am still aghast at the sheer magnitude of the production itself, and the performances from Gable, Leigh, Olivia DeHavilland, Thomas Mitchell and Hattie McDaniel. Yet, at nearly four hours I think the film loses some momentum in the second act – at least up until the last 20 minutes or so. That doesn’t make it a bad film, but I get the sense that after Scarlett’s legendary proclamation that “I’ll never be hungry again.” there is a tone shift and the next hour and the movie kind of drags. That opinion will probably earn me a number of detractors but I doubt anyone would disagree with me about my choice for Best Picture, a film that is even more beloved and has probably been seen by more people, The Wizard of Oz. Cinematically, the two films are not that far apart, due to the fact that they were both distributed MGM and had a similar series of rotating directors (both rotations ended with credit going to Victor Fleming). Both films have the same amount of fans but I think my choice has more because it comes to us as children. I imagine more people are willing to put themselves through the sentimental charms of Oz rather than the four hours of Gone With the Wind. Both The Wizard of Oz and Gone With the Wind have a similar theme. Both are about young girls who break way from the cushioned self-containment of their comfortable world and are forced to do some growing up. Yet, Dorothy and Scarlett take the same journey in opposite directions. As Gone With the Wind opens, we see Scarlett in her comfortable plantation home, an antebellum fantasy world where her only concern is looking pretty and choosing a suitor. Then the war comes and she takes the hard road in a cold, cruel world. Dorothy, by contrast, begins in a cold sepia-toned Kansas dustbowl in which her aunt and uncle work to keep food on the table (this was the depression) and then is whisked into a fantasy land where she must take a hard road in order to survive. Both women fight for their survival, and for the dream of returning home; Dorothy to Kansas and Scarlett to the plantation of Tara. The journeys are similar but the intentions are different. I think we identify more with Dorothy because her journey is more basic, and less of a soap opera. 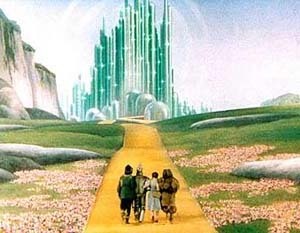 The Wizard of Oz remains the most beloved of Hollywood films because it is unique among motion pictures in that it mirrors our longings and imaginations as children. 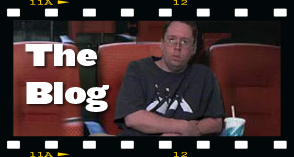 The movie, in front of and behind the scenes, has become movie folklore. We love the legends about the rotating directors. We know the legend of Buddy Ebsen, who had to drop out due to an allergic reaction to the silver Tin Man face powder; and Margaret Hamilton, whose dress caught fire and nearly had her face burned off because of the copper-based make-up. We love stories about all the problems on the set from personal feuds to sweltering costumes to partying munchkins; and the costume designer who had to keep up with Judy Garland’s developing bust line. There’s even a spurious legend of a ghost on the set (it’s actually a bird). All of these elements make The Wizard of Oz a much bigger legend than it already is, but that’s okay because this is the one movie that deserves to be over-hyped. It occupies such a large part of our memories that we want to make it more than it is, to just have one more reason to make it more than a movie; we want it to be an experience. That experience is brought to us because we are intimately familiar with its story elements. The dreams that Dorothy sings about and the adventure that follows seem to mirror our yearnings as children. She imagines a bigger place where her problems don’t linger and she is free to explore them. She imagines a place where there isn’t any trouble and people actually listen to what she has to say. She sees the rainbow as her golden gate to a better place because in her drab sepia-tone Kansas world, the rainbow is the only source of color that she knows. She dreams of a bigger place and imagines a world where troubles melt like lemon drops. We can relate. How many of us as kids sat in our room or in our yards and played, imagining a place to go and characters to interact with, a colorful world bigger than our small, confined world. Oz is meant to represent the colorful palette of our imagination but for Dorothy it is also a place where she does some growing up. The three friends that she meets along the way, The Scarecrow, The Tin Man and The Lion are emblematic of the lessons of bravery, love and devotion and the ability to think for ourselves. The Wicked Witch of the West certainly represents the real dangers along the way. For Dorothy there is a motherly figure, Glinda the Good Witch who intends for Dorothy to discover for herself how to solve her problems, she knows that Dorothy must grow up along the way. In a way, she seems to represent the parent that Dorothy doesn’t have back in Kansas. Her elderly aunt and uncle love her but this was 1939, in the midst of the depression and we imagine the climate that they live in, where work means keeping the farm. No work = no farm = no home. If movies are a time capsule, then The Wizard of Oz wonderfully captures a brief moment of happiness in Garland’s life. We know of her problems with studio executives who put her through an exhausting schedule, using drugs to get her going in the morning, then to put her to sleep at night. We know the legends of her mental and physical problems that dogged her most of her life, but The Wizard of Oz sees her at a moment in her life when it all seemed perfect, just as her star was rising and before her problems really began. There is poignancy in that, and that’s why I think that the casting of Shirley Temple in the role would have been a mistake. By 1939, Temple was the biggest star in the world and her presence in the film would have been too much. She would have stood out and we would only seen Shirley Temple, not Dorothy Gale. Garland’s presence allows the story credibility. I have tried to imagine that famous dance down the Yellow Brick Road with a 4 foot child and it just doesn’t fit. If Garland gives the film its center, then I think the production design – awe-inspiring in 1939 – is the perfect backdrop. In these early musicals filmed on a soundstage it isn’t hard to spot where the soundstage ends. Some have seen that as a flaw but I think it adds to the dreamlike quality of the film. The matte paintings behind the sets add to the storybook quality. The fact that we’re in a dream makes it okay that the special effects look a little hasty. That was the genius of the screenplay, that and to establish the Oz characters as characters that Dorothy meets in Kansas. In our dreams we often see people and events that have recently occurred in our lives, but this is the first time I’ve ever seen it expressed in a movie. In particular is the notion that Professor Marvel keeps showing up as various characters in the dream. What generosity these filmmakers had. What ingenuity to create this entire world that is colorful and beautiful and scary. What depth of character they created. What messages they send. This is a movie constructed with loving care. We’re told that those who worked on the film thought of this as just another movie, but when I watch the film I find that hard to believe. Certainly from the screenwriters. I wonder if they saw how brilliantly they were tapping our frustrations and our excitement, our dreams, our need and our sense of wonderment. I wonder if they knew the impact of what they were working on, that the lovely sentiments that they created would still resonate 70 years later. I wonder if they knew that their heart’s desires weren’t that far from our own. By winning over Clark Gable in the Best Actor race, British stage actor Robert Donat was the only thing that kept Gone With the Wind from becoming the second film to win Oscars for Best Picture, Director, Actor, Actress and Screenplay. Donat’s performance as Charles Edward “Mr. Chips” Chipping, an English school teacher who looks back over his career and the events that shaped his life, would become his defining role despite equally good work in Hitchcock’s The 39 Steps and as Thomas Culpepper in The Private Life of Henry the VIII. Donat didn’t much like Hollywood (he didn’t attend the ceremony) and spent most of his career on the stage and by the time of his early death at the age of 53, he had only made 19 films. Although he prevented a Gone With the Wind sweep, few thought Gable had a chance to win. Donat’s chief competition was my choice, Jimmy Stewart for his breakthrough role in Frank Capra’s Mr. Smith Goes to Washington. Donat’s performance admittedly tugs at the heart but the legacy of Goodbye Mr. Chips seems to have slipped from public consciousness. That’s probably because today the film seems dated especially when you look at the long lineage of better and more thoughtful inspirational teacher movies that would follow – and personally I can think of at least ten that I like better than this one *. While Donat’s performance has become a sort of footnote, Jimmy Stewart’s performance as Mr. Smith has become part of the tapestry of American movie folklore. Mr. Smith Goes to Washington is Jimmy Stewart 101. This is where I start when I want to get someone interested in Stewart’s work because it personifies all the reasons why he became a star in the first place. Stewart’s career was an evolving process. Here he establishes the unflinching every man, the guy with his hands in his pockets and an unshakable patriotism in his heart. Mr. Smith represents the pre-war optimism that attracted him to the American public. Here he plays Jefferson Smith, a naive and idealistic leader of The Boy Rangers who is appointed by his state’s weak-kneed governor who appoints Smith at the forceful urging of his children. Smith accepts the position and finds himself under the wing of the state’s senior senator, one Joseph Paine (Claude Rains) who seems to have once shared Smith’s ideals but now in his later years, has pale skin and white hair that seems to symbolize that he is merely a ghost of his once-idealistic self. To their surprise, Smith isn’t the simpleton that he appears to be. When he proposes that a territory be turned into a boy’s camp to be funded by contributions from the boys themselves, he begins to uncover the seedy machinations of Taylor and Paine. Attempting to stonewall Smith’s efforts to expose them, they turn his name into mud by turning his plans for the boys camp into a national front-page scandal. As these corrupt politicians attempt to break Smith’s spirit, Smith strikes back, holding a filibuster until he can be heard. Standing on the senate floor reading, talking and walking up and down he tries to hold the proceedings in deadlock because if he stops talking or sits down, he relinquishes the floor. After several days, hoarse and exhausted, he makes an impassioned speech about his futile lost cause and passes out on the House floor. Paine’s conscience gets the better of him and he confesses to his misdeed. Stewart was not new to moviegoers, he had a smaller, less impressive role in Capra’s You Can’t Take It With You, but Mr. Smith Goes to Washington afforded him a darker tone. He begins as a complete innocent, with stars in his eyes, but when he sees the corruption of the political system, it threatens to shake his own beliefs. In the end, it is one of Stewart’s best moments, during his filibuster as contending letters come flooding into the senate chamber, Smith refuses to give up even if the odds are stacked against him. It is a David and Goliath story but the muscle is replaced by idealism. Stewart’s popularity came from his ability to mirror the common man. Most people didn’t look, walk, talk or act like Clark Gable but a good many had more have the stature of Jimmy Stewart with his lanky stature, his hands in his pockets, his “aw, shucks” demeanor, his gentle spirit. He and Mr. Smith were the perfect symbols of America during the Roosevelt years. As America was coming apart from The Great Depression, many Americans wanted to hold on to the unshakable faith that Smith has in his beloved country. But Capra realizes that this isn’t reality and as the film grows darker, as Smith becomes more frustrated and weary, he realizes that the ending is the true portrait of America. * – Blackboard Jungle (1955), Children of a Lesser God (1986), Dead Poets Society (1989), Half Nelson (2006), The Karate Kid (1984), The Miracle Worker (1962), Mr. Holland’s Opus (1995), Music of the Heart (1999), The Paper Chase (1972) and To Sir With Love (1967). For the only time in the decade, I agree with the Academy’s choice for Best Actress. It is hard to disagree that Vivien Leigh gives one of the best performances perhaps in the history of the screen. This is, after all, a role as coveted and iconic as the film itself. There probably isn’t much factual history inside Gone With the Wind but I’ve never felt that this was its purpose. Here is a movie that presents the south of the Civil War more or less the way we’ve heard about it, with its southern belles, it’s suitors, the plantation, the rigid social code of conduct and then places at it’s center a woman who has no use for any of those things. Leigh plays Scarlett O’Hara with every note possible, and we see the character grow and change, even if her treatment of men doesn’t mature at all. It is easy to view Scarlett as just a temperamental man-hungry southern belle, prone to hissy fits, who pursues one man with passion while falling reluctantly into the arms of another. Scarlett O’Hara is the antithesis of the world in which she exists. She is stubborn and independent, she is man-hungry and pursues the dunderheaded Ashley Wilkes for no other reason than that he is promised to someone else. Scarlett was ahead of her time. She is more aggressively sexual than the social order of even the 30s might have allowed. She married to keep from being an old maid, then pursues one man while resisting another. Then she turns away the marriage bed for fear of losing her figure to childbirth. I think the reason the movie fascinates us so much is that we are taken into her world and we see it through her eyes, whether we agree with what she is doing or not. She sees what she wants and takes it, she is keen but not perceptive. If she had been at all perceptive then she might have seen that the roguish Rhett Butler, whom she resists, is almost her exact equal. He is no gentlemen, he visits Miss Whattling’s house of ill-repute and openly admits that he runs blockade only for profit. Yes, they are perfect for one another and the reason we are so willing to fall into their romantic struggle is because we know that their attitudes will be the social norm, set in place in the years after the Civil War. Morality and the social rigors will begin to soften as the world turns rapidly into the 20th century. Scarlett exists at a point in time when the function of a young woman is to look pretty, land a husband and have babies. We know that Scarlett has no use for the social order, she is used to doing what is necessary to get what she wants. What is most unexpected is the way in which she casts off the role of southern lady and begins toiling in the dirt to save the family farm. Her sisters complain about callused hands and sore backs but if you step back and compare Scarlett with the other women in the movie, you will see a woman that will survive once the war has ended because she has learned how to face it head on. She is a survivor, she has learned how to scheme and manipulate to get what she wants. In a way, her passion in life is paved by the risky pursuit of handsome Ashley Wilkes, not because she loves him but by virtue of the fact that she can’t have him. Strangely enough, it takes a man to make Scarlett so fierce. When we first meet her, she’s sitting on the porch at Tara, her face bright and cheery in the Georgia sun. She is surrounded by a flock of potential suitors. This would be the position she would seek to find again in life, the option of having her pick of the man she wants even when he belongs to someone else. 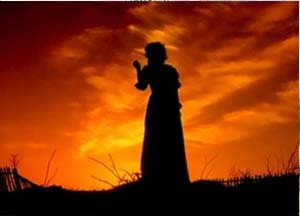 Gone With the Wind is, first and foremost, Scarlett’s story. She provides the narrative and the entire business of the war is seen through her eyes. We never see any battles, only a street lined with wounded men when she goes into town to fetch a doctor for Melanie. Slavery is not seen as a criminal act from her point of view, and in fact it is barely seen at all. Two women, Mammy (Hattie McDaniel) and Prissy (Butterfly McQueen), work in the house but are probably. Mammy’s function seems to be as a surrogate mother to Scarlett, her role is a great deal larger than one expects. Prissy is seen a simple underling. From the point of view of a southern belle at the time she wouldn’t have been witness to the beatings or the slaves held in chains. The movie has been blamed for having a naive attitude about the events of the Civil War, but given her view of things, it seems pretty accurate. One scene involving the Ku Klux Klan was written but thrown out. I think that was a wise move because it would have broken up the narrative flow. Seeing the Klan and knowing how we feel about them would have taken us out of Scarlett’s world view. That point of view allows us to see Scarlett grow over the course of the movie, from winsome southern belle, to frustrated widow, to a woman who rises from the ashes of the war, determined to never be hungry again. After that lies her transformation to revolutionary as she determines to return Tara to its former glory by working the field herself. By the time she arrives back to Tara to find it plundered by Yankees, we know that Scarlett’s stubbornness will take hold and she won’t give up until she gets what she wants. We know she will prevail even when others give up in distress. Inside her personal struggle to save her home and keep her pride, she still pursues an unwise sexual misadventure in her lust for Ashley Wilkes. Despite his devotion to Melanie she presses on, even as Rhett Butler makes his intentions known. She thinks he’s a brute, a hard-drinking, womanizing rogue, but if she stops to think about it, she’s not much better. They’re perfect for one another. “You should be kissed and often and by someone who knows how” he tells her and in a sense, she knows he’s right. Both are skilled at breaking the rules of engagement in order to get what they want, reputation be damned.